Exploring places of interest to sadhaks of the integral yoga. Having to go out of India every six months for a visa might seem like a real hassle. I’m always happy to do it though. Why? Well, there are two reasons. The first is that I am usually fed up with India on some level and ready for a break. What I really look forward to however is the chance to spend some time at Nilambe Meditation Center in Sri Lanka. For those who haven’t heard of it, Nilambe is a small meditation center located at the top of a tea estate in the hills near Kandy. There is no electricity and conditions are basic, but beauty and silence abound making it an ideal oasis for the work-weary sadhak to take some much needed time for meditation and introspection. At first glance this might seem like a pretty demanding program. In reality though it’s not nearly as demanding as the daily schedule for a Vipassana course1 and it has a lot more flexibility. Certain things like chanting, yoga classes, and discussions are optional and many people use the ‘Individual Meditation’ and ‘Meditation with Nature’ times to read, chill out, or take a walk in the surrounding countryside. For the ‘Working Meditation’ you are also left to your own judgement to decide how you want to occupy yourself during that time. There’s always plenty to do though such as cleaning, sweeping, weeding, food preparation, tidying the meditation hall etc. The atmosphere at Nilambe is quite laid back and nobody is going to be breathing down your neck if you don’t adhere to the schedule perfectly. They are however fairly strict regarding some traditional buddhist precepts for dress and conduct. The first is the separation of the men and women into separate living areas. The second is a ‘dress code’ which basically boils down to covering up as much skin as possible including knees and shoulders which are expected to be concealed at all times. Lastly there is the Noble Silence which is maintained at all times except for the four o’clock tea break. Now let’s take a look at some practical information for the potential visitor. Accommodation at Nilambe consists of either single or double rooms with shared bathrooms. The mens rooms (and I assume the womens as well) are simply furnished with a bed and a nightstand. Some of the rooms however don’t have mosquito nets, and I recommend picking one up in Kandy before you get to the center unless you want to spend your nights breathing in mosquito coils. Nilambe charges a fee of 500 SLR per day for your food and accommodation. This works out to be about 4.75 USD or 210 INR and is quite reasonable in my opinion. The center is of course open to larger donations if you wish to make them. I would also encourage people who visit Nilambe to leave a tip for the often grumpy but hardworking kitchen staff. Food at Nilambe is tasty and nutritious though some dishes might be a bit spicy for some people. The menu is also a bit repetitive if you stay long term. Kandy however is fairly close, so its easy to head there for a day trip and satisfy your palate with a stop at Kentucky Fried Chicken, Pizza Hut, or one of the local restaurants such as the Devon or the Pub. You are also free to bring your own food to the center. I usually bring some fruit and biscuits to snack on if I get hungry in between lunch and the bedtime snack. The first thing you have to do is get to Colombo and flying is your only option. Round trip airline tickets are available from Chennai to Colombo for 7000 INR from JetLite and 9000 INR from Sri Lankan Airlines. I have also heard that it is possible to get a 5000 INR ticket from Indian Airlines if you go to one of their offices. Once you are in Colombo airport you can take a rickshaw, or tuk-tuk as they are called in Sri Lanka, for around 400 SLR to the Negambo bus stand and then catch a bus from there to Kurunegala and then another bus from there to Kandy. It should be about 200 SLR for both buses if I remember correctly. Taxis are also available and can be arranged at the airport. Once you reach Kandy you have two options for getting to the center. First you can take the Galaha/Deltota bus #633 (about 20 SLR) to the Nilambe Office Junction 17 km away. From there you have three more km to go, up a steep and poorly maintained road. You can either hoof it or jump in a tuk-tuk. The cost for a tuk-tuk at the time of this writing was 250 SLR. Be aware however that there is a gate about two-thirds of the way up which is sometimes locked. If it is you will have to walk the last stretch. Your second option is to take a tuk-tuk from Kandy all the way to the center itself or to the gate depending on your luck. This should cost in the neighborhood of 1000 SLR or so. From what I understand, if you want some help arranging this go to the Buddhist Publication Society in Kandy. When it’s time for you to leave the Nilambe staff can arrange for a tuk-tuk to come up to the center and either take you to the bottom of the hill (where you can catch the bus to Kandy) or all the way to Kandy itself. Alternatively you can walk down the hill (a rather nice walk I might add) and take the bus or a tuk-tuk from there. Here is a list of the things the center recommends that you bring as well as a few suggestions of my own. Also if you will be traveling with cash, be sure to change your Indian rupees to dollars or euros BEFORE leaving India. You cannot change Indian rupees at banks or change houses in Sri Lanka. You can still change Indian rupees ‘unofficially’, even at the Colombo airport, but you’ll get a lousy exchange rate. Kandy is also a nice place to spend a couple of days. There’s a very nice and affordable guest house run by monks where you can stay for just 200 SLR a night. It’s called the Burmese Rest House. Nearby is the Sri Dalada Maligawa otherwise known as the temple of the tooth which claims to have one of the teeth of the Buddha. Another place worth visiting is the Royal Botanical Gardens which is a lovely place to spend the day. Then there’s Helga’s Folly which has been ranked as one of the world’s most unique hotels and is a must see if you are in Kandy. I have paid five visits to Nilambe over the past three years, staying for as little as a week to as long as a month. I have always found my stays there to be beneficial though I have encountered some difficulties. The biggest problem I have had, especially during one long visit, was increased activity of the vital mind. I’ve also had some lesser problems with depression. I doubt I’m unique in this regard. When you suddenly find yourself free of all the things that normally occupy you, it’s easy for these sorts of things to come in and fill the emptiness. I’ve never done it, but I imagine a trip to Kandy would help to alleviate things if you found yourself treading water. The best thing I’ve found though is to just keep throwing these things out until they either stop coming or lose enough of their strength so that if they do come they don’t have the power to carry you off for any appreciable length of time. On the positive side of things, even during short stays I have noticed a rapid amplification of the dream life in terms of both quantity and clarity. I can’t say the same about the voice and vision.2 I have however gotten some good lines of a buddhist flavor while there. Also, the title of the column From First, From Within came to me during a stay at Nilambe. It makes sense too that while at a place like Nilambe, if you can avoid the potential pitfalls of a retreat situation, you would find yourself feeling more peace, detachment, joy etc. But I also find that after a good clearing out at Nilambe life in Pondy is easier to deal with upon my return. That effect fades after a time, but I have found, especially on my last two trips, that some change of a permanent nature has also occurred which doesn’t fade. For me this has been mainly in the area of surrender, but for others it might manifest in a different way. The point is that I am quite convinced of the utility of periodic retreats for the purpose of psychological integration and I feel that many sadhaks would benefit from such experiences even though they might not be appropriate for everyone. 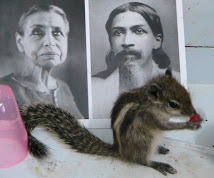 It seems to me that places like Nilambe are and will be quite useful places for sadhaks of the integral yoga to take such retreats and and I would even go so far as to say that I think Sri Aurobindo and the Mother have their eyes on Nilambe. Let me explain why. On my second trip to Nilambe I went to the library to see if The Experience of No-Self by Bernadette Roberts was available. I found the book in the library and walked outside with the intention of checking it out and who should I see staring up at me but Sri Aurobindo himself! There on the librarian’s table was a stack of books and the topmost book was a biography of Sri Aurobindo with his face on the cover. At that moment I took this synchronicity as Sri Aurobindo showing his approval of my choice of reading material. As I thought about it afterwards though I thought he might also be trying to show me that he and the Mother have a presence there at Nilambe. If that’s true I can only speculate about why that is, but if what I’ve said about the utility of retreats is accurate it makes sense that Sri Aurobindo and the Mother would establish themselves at a place as close as Nilambe which can be easily reached by their sadhaks. Perhaps in the future, as religious boundaries are transcended in the development of a world spirituality, Nilambe will become a popular destination for Pondy based sadhaks. But why wait until then? I wouldn’t have written this article if I didn’t want to encourage people to go to Nilambe now. Just try to discern if you have a real inner call to the place and not just a vital one. For those who want or need more information on either Nilambe or Kandy please contact the center itself or consult Mr. Google. 2. This is only in my case. I imagine someone with a strong opening in this area would notice a difference. 3. Sri Aurobindo, Savitri–Part 2, Sri Aurobindo Birth Centenary Library Volume 29, Sri Aurobindo Ashram, Pondicherry, p. 384. Can/do you recommend any where similar you know of Nilambe in India?? ?